Entertaining doesn't mean giving up the foods you love! It's easy to celebrate parties and holidays and stay on the South Beach Diet. Preventive cardiologist, Dr. Arthur Agatston, who has helped millions of people the world over to lose weight and eat more healthfully, shows you how the basic nutritional principles of the South Beach Diet -- choosing good, unsaturated fats; nutrition-rich, high-fiber fruits and vegetables; lean sources of protein; and low-fat dairy -- easily translate to preparing and enjoying special occasion meals throughout the year. Whether you're inviting a few friends and relatives for a weekend brunch, throwing a baby shower or a backyard barbecue, celebrating Valentine's Day, the Fourth of July, Christmas, or Hanukkah, or launching your South Beach Diet with a Phase 1 kickoff party, The South Beach Diet Parties & Holidays Cookbook is filled with more than 20 menus and 150 recipes that will make every party or holiday celebration memorable. No need to worry about what South Beach Diet dishes go together. We take all the guesswork out of menu planning for you. Whether you're making Shrimp Salad in Cucumber Cups, Roast Turkey with all the trimmings, Crown Roast of Pork with Apple-Onion Chutney, Matzoh Ball Soup, Chicken Cassoulet, Ricotta Cheesecake, or Pumpkin Pie, you can be certain that every recipe meets the South Beach Diet guidelines for healthy eating and great taste. Dr. Agatston also provides plenty of practical advice about maintaining your South Beach Diet lifestyle throughout the holiday season and making the best food choices possible whatever the occasion. In addition, full-color photos provide ideas for stylish food presentation, beautiful table settings, and creative centerpieces. And for every menu there are helpful nuke-ahead tips for stress-free entertaining. 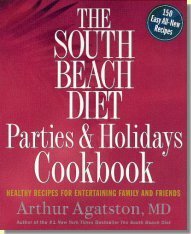 Remember, the South Beach Diet is about living well. This book is your essential guide to preparing satisfying, delicious, and healthy meals for every special occasion.